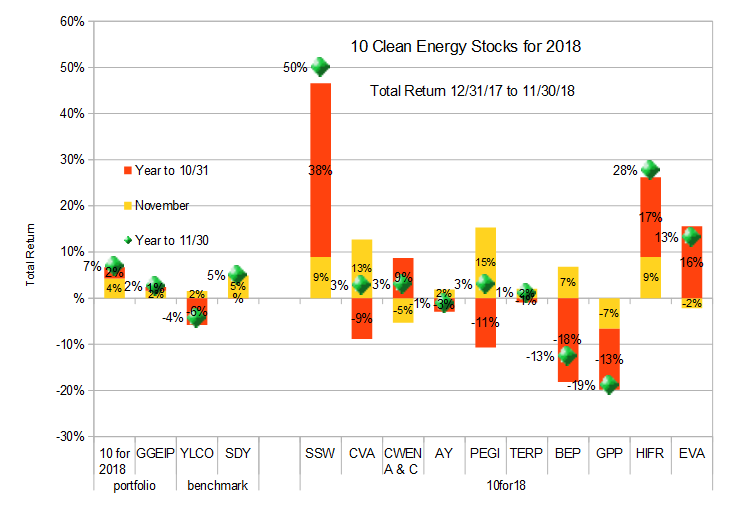 At the start of November, I abandoned my short-term bearish stance on the market, writing “I’m not confident that the correction is over, but we seem to be heading into a temporary lull, and so I’m going to abandon cash as my top pick for November.” This turned out to be a good call, with my Ten Clean Energy Stocks model portfolio up 4.3% for the month, slightly behind its broad dividend income benchmark, SDY, which was up 4.9%. Its clean energy income benchmark YLCO gained 1.6%, as did the private portfolio I manage, the Green Global Equity Income Portfolio (GGEIP). 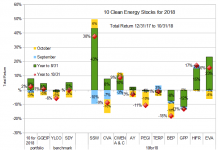 For the year through November, the model portfolio is up 6.8% beating both its benchmarks at 4.9% (SDY) and -4.3% (YLCO). GGEIP is up 2.4%, well ahead of the clean energy income benchmark, but lagging the broader universe of income stocks. Last month, I chose Green Plains Partners(GPP), Covanta Holding(CVA) and Brookfield Renewable (BEP)as my top short term picks. GPP fell 6.6%, while CVA and BEP gained 12.7% and 6.8% respectively, for an average gain of 4.3%, slightly behind the average stock in the model portfolio. I think Green Plains Partners is in a good position for a strong rebound in December, so that will be my sole short term pick for the month. This will be an abbreviated update, focusing only on the handful of stocks that have had significant news since the last two updates at the start of November (here and here). 12/31/17 Price: $6.75. Annual Dividend: $0.50 (7.4%). Expected 2018 dividend: $0.50 (7.4%). Low Target: $5. High Target: $20. As mentioned in November, I will be taking gains in Seaspan and dropping the stock from the list in 2019, because I no longer consider the stock to be “green” due to an investment in liquefied natural gas facilities. 12/31/17 Price: $16.90. Annual Dividend: $1.00(5.9%). Expected 2018 dividend: $1.00 (5.9%). Low Target: $15. High Target: $25. Covanta had nice gain in November, but no significant news. 12/31/17 Price: $18.90 / $18.85. Annual Dividend: $1.133(6.0%). Expected 2018 dividend: $1.26(6.7%) Low Target: $14. High Target: $25. Clearway’s stock sold off significantly due to its large number of above current market price Power Purchase Agreements with PG&E (PCG). PG&E is facing the threat of possible bankruptcy due to liability from its equipment possibly being the cause of several of the recent fires in Californian, including the devastating Camp Fire. The stock recovered somewhat when California’s utilities regulator, CPUC signaled that it was committed to ensuring reliable electric service for PG&E customers (which could possibly be disrupted in a bankruptcy), even if the utility may need to be restructured. 12/31/17 Price: $21.21. Annual Dividend: $1.16(5.6%). Expected 2018 dividend: $1.39 (6.6%). Low Target: $18. High Target: $30. Atlantica Yield rose modestly in November along with the rest of the market. 12/31/17 Price: $21.49. Annual Dividend: $1.688(7.9%). Expected 2018 dividend: $1.70(7.9%). Low Target: $20. High Target: $30. Yieldco Pattern Energy Group rallied strongly after third quarter earnings discussed in the last update. 12/31/17 Price: $11.96. Annual Dividend: $0. Expected 2018 dividend: $0.72 (6.0%) Low Target: $10. High Target: $16. Yieldco Terraform Power drifted higher with the market on minimal news. 12/31/17 Price: $34.91. Annual Dividend: $1.872(5.4%). Expected 2018 dividend: $2.02(5.8%). Low Target: $28. High Target: $45. 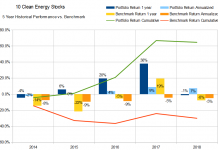 Brookfield Renewable Partners recovered some of its losses from earlier in the year, but not on any significant news. 12/31/17 Price: $18.70. Annual Dividend: $1.84(9.8%). Expected 2018 dividend: $1.90(10.2%). Low Target: $13. High Target: $27. Ethanol MLP and Yieldco Green Plains Partners continue to struggle because of a weak ethanol market caused by the Trump EPA granting waivers to favored oil refiners which are undermining the biofuels market. Retaliatory tariffs on ethanol and a weak oil market are also hurting the stock. However, the oil market has begun to recover based on a new cooperation agreement between Russia and OPEC, and the EPA is reviewing its policy on waivers. I continue to think it is time to buy GPP while fears about the ethanol market have the stock trading remarkably cheaply. 12/31/17 Price: $18.58. Annual Dividend: $1.00(5.4%). Expected 2018 dividend: $1.00 (5.4%). Low Target: $16. High Target: $30. Electricity transmission REIT InfraREIT traded well above the $21 offer price from Sempra Energy (SRE) owned utility Oncor, but collapsed back down to $21 on December 4th when a second possible acquirer withdrew its non-binding offer. The Oncor acquisition remains on track. As I wrote in November, I will be dropping HIFR from the 2019 list because of the acquisition. I hope that some readers managed to get out at the temporarily inflated prices above $21.50. My fund has made some nice gains trading the volatility, but also had some significant potential losses when the stock was above $22. 12/31/17 Price: $27.65. Annual Dividend: $2.46(8.9%). Expected 2018 dividend: $2.65 (9.6%). Low Target: $25. High Target: $40. Wood pellet Yieldco and Master Limited Partnership Enviva gave back some of its gains in November, but without any significant news after the recent earnings report. I continue to be very concerned about stock market valuation, and expect the correction that started last summer to continue in 2019. However, I expect December may continue the market rebound we saw in November, so I see the coming month as one in which to opportunistically take profits and increase allocations to cash in anticipation of better buying opportunities in 2019. 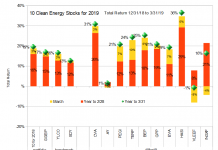 Like the last two years, I am offering paying readers a preview of my Ten Clean Energy Stocks for 2019 list. I plan to publish the final article on Tuesday January 1st. 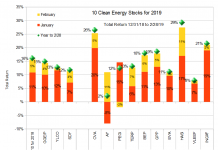 If you would like to see a draft version mailed on Sunday December 30th (a full trading day before the final publication) please PayPal $10 to me at tom at alt energy stocks dot com (no spaces) with a note that it’s for the 10 for 2019 preview. The draft will contain the full list, but may not have a complete stock discussion for each stock… I expect to be working on the final version up to publication. Disclosure: Long PEGI, CWEN/A, CVA, AY, SSW, TERP, BEP, EVA, HIFR, GPP.